There's a false narrative that has persisted far too long among retailers large and small complaining about Amazon's growth across retail categories. The complaints range from predatory pricing to inventory and online experience and fulfillment. The blame game heaved upon Amazon for the failure of retailers from corner stores to mall anchors like Sears and JCPenney is an excuse for others' failure to execute. Many articles have been written over the past year detailing more reasons for the so-called retail apocalypse from The Atlantic to Bloomberg and The Wall Street Journal. While all of their reasoning regarding debt-loads, overbuilds, and technological innovation are valid at a macro level, what hasn't been addressed is the microeconomic decision-making at a transaction level. 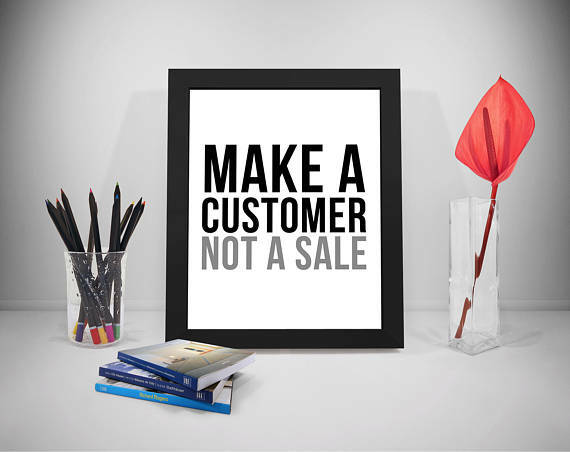 I'm talking about selling - not merchandising, advertising, inventory - just pure sales and customer service skills. n a recent visit to the King of Prussia Mall last week, my eldest daughter noted that visits to eight different apparel retailers, not a single salesperson or customer service associate at any of the stores offered to help her find her size or even inquire about her style, interests, goals - or anything else for that matter. Did we make some purchases? Yes, but not nearly as much as what would be possible selling to a teenage girl. This isn't limited to apparel. Just walk into any big-box retailer. If you can find an associate, chances are they're focused on stocking inventory not helping customers. It wasn't always this way, and it isn't this way at those specialty retailers who are thriving. Those places where you walk in, are warmly greeted by a salesperson asking, "What can I help you find today?" and "What projects are you working on?" and "What questions can I help answer for you?" Retailers that have associates who are helpful, knowledgeable and professional salespeople are the difference-makers in the customer experience. Because they show a genuine interest in the customer's goals, they are better able to upsell and cross-sell - and sell against an Amazon because they can do what Amazon cannot - have an intelligent, meaningful dialogue with the customer, uncovering hidden needs, building rapport and demonstrating value beyond the physical products all while making the customer feel good about the experience. This is the advantage that traditional brick-and-mortar retailers have over Amazon - with or without Whole Foods. Executing this customer-first approach starts with employee training and ends with retaining top producers. Learn from Circuit City's decision in 2007 that doomed the former Good to Great company. Today average training per new retail employee is a mere seven hours in the United States. Poorly trained employees are less productive and make more errors. Is it really any wonder retailers are failing? Retailers that have stripped out sales training and customer-focus often cop-out excuses about Amazon's pricing, product selections, and fulfillment - but that's a sucker's game. Retailers today can't and won't beat Amazon playing on Amazon's turf - that's their game with their rules. The way to beat Amazon and eat their lunch is by training associates to become salespeople - true customer-service professionals - helping each and every customer to achieve their goals, asking questions and following through to complete the sale. It's not rocket science and you don't need deep analytics - it's just smart business. When backed up with a specific set of operating practices, investing in employees boosts customer experience and decreases costs. Companies can compete successfully on the basis of low prices and simultaneously keep their customers and employees happy according to Zeynep Ton, Professor of Operations Management at MIT Sloan School of Management, co-founder of the Good Jobs Institute, and a fellow at the Martin Prosperity Institute. She is the author of The Good Jobs Strategy: How the Smartest Companies Invest in Employees to Lower Costs and Boost Profits. If it is possible in retail - arguably the most difficult of environments - it is possible elsewhere from banking, healthcare, automotive, hospitality and so on. Many executives in businesses with slim margins believe that one can succeed is at the expense of their employees. Those businesses are often understaffed and lack proper knowledge and skills to serve customers well. Customers served by harried staff, in chaotic settings share negative buying experiences that are unpleasant with difficulty finding what they want and getting help, nearly impossible. The result is lower same-store sales and revenue per transaction. Amazon will run its business with or without its present competitors. Retailers that run their business by focusing on developing employees and helping customers. It starts with a sincere interest to serve and a simple greeting. "Good morning. What brings you in today?" can open a world of new possibilities for customers and companies. Those that do make their employees the very best and their companies become the very best - with the sales results to prove it.